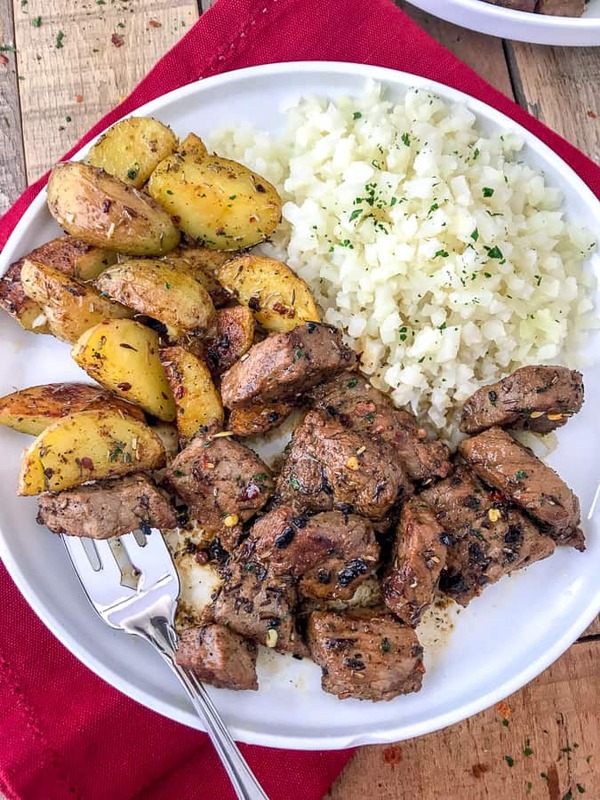 Garlic Butter Steak and Potatoes – this is the quick, easy and beyond delicious recipe you have been looking for! 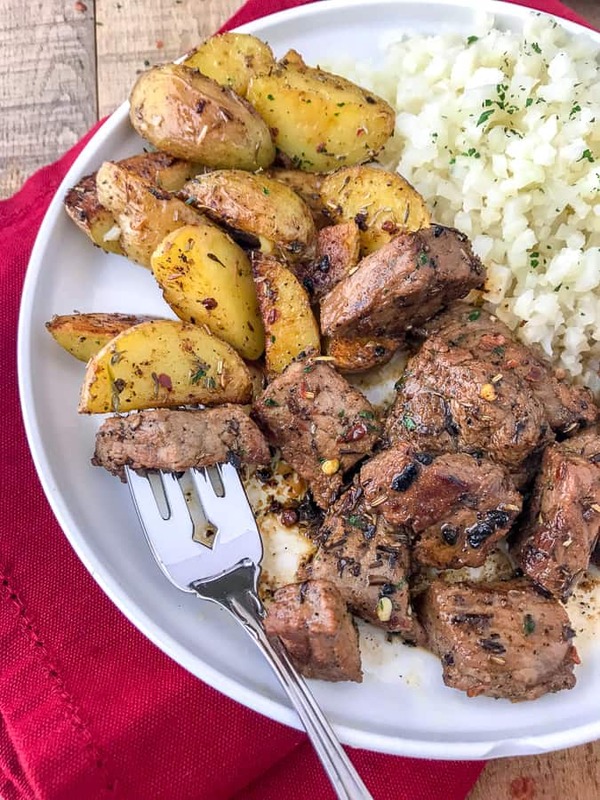 Juicy, savory steak and potatoes seasoned with garlic and herbs and cooked in butter in one skillet. A delicious dinner has never been simpler! 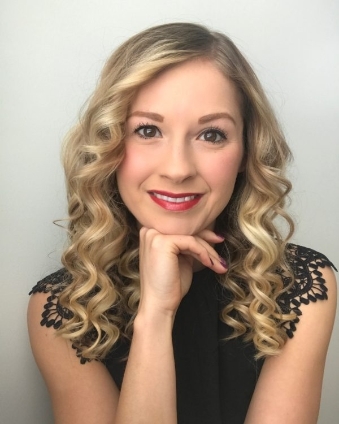 With the holidays in full force, it is essential to make life as easy as possible right now. One way to make life less complicated? Make your meals easier! 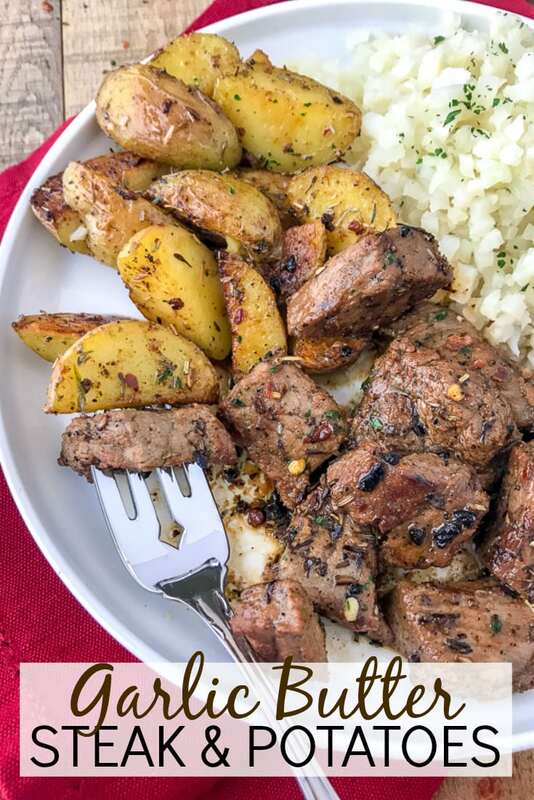 Whether you need something easy to make tonight for your family, if you live life on the go, want to create a delicious meal for your friends this weekend, or you’re a meal prep lover – make this Garlic Butter Steak and Potatoes dish! YOUR FRIENDS WILL BE ASKING FOR THE RECIPE! Time is too precious this season to be stressing over what to put on your table. Try this recipe and serve it with a side salad, with Garlic and Lime Cauliflower Rice, Maple Roasted Carrots, or your favorite side dish! 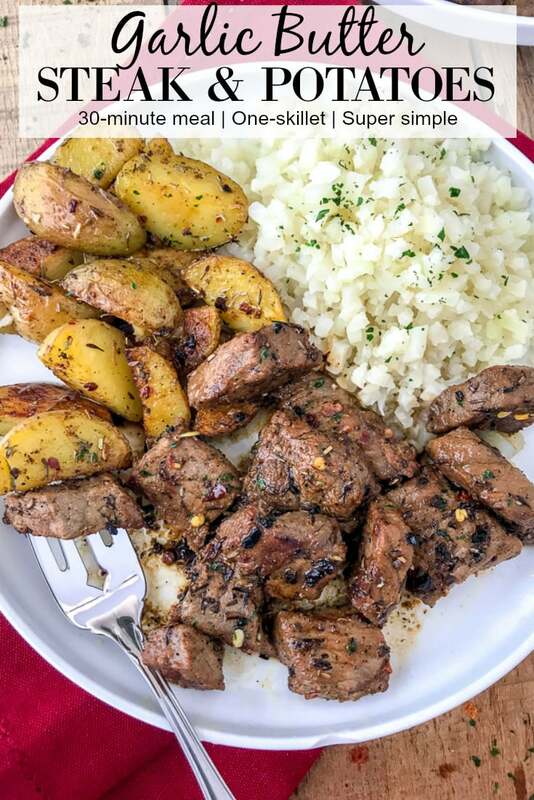 Steak and potatoes go together like peanut butter and jelly. Like french fries and ketchup. Chips and salsa. Bacon and eggs. Grilled cheese and tomato soup. Macaroni and Cheese. I could go on and on. So to create a dish like this that not only pairs well, but also has a medley of delicious flavors? No brainer! And you are going to love it! Lodge Seasoned Cast Iron Skillet – 12 inch: when making this recipe, make sure to use a cast iron skillet or pan that is large enough to accommodate the ingredients. This 12-inch skillet works perfectly! Five Ingredient Buffalo Chicken Stuffed Zucchini Boats – an easy, low-carb and healthy recipe that comes together with a handful of ingredients and in no time! 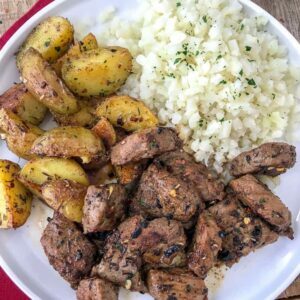 Easy Tender Instant Pot Turkey Breast – want to make a full turkey breast in around an hour? Try this recipe in your Instant Pot! Tender and full of flavor, without the hassle of waking up at the crack of dawn or basting every 20-30 minutes. Crispy Parmesan Chicken Meatballs – amazing meatballs that are perfect as a main dish and paired with spaghetti squash! A very popular, easy recipe on my blog! Easy One Pot Lasagna Soup – enjoy lasagna without the hassle of layering! This recipe comes together in one pot and is full of Italian flavors! Garlic Honey Lime Shrimp and Zoodles – a simple, low-carb meal option if you’re looking to keep it light in between holidays. Shrimp is cooked to juicy perfection! Flavorful, juicy and tender throughout. This super simple meal comes together in 30 minutes or less in one skillet! Sure to be a hit with your family! 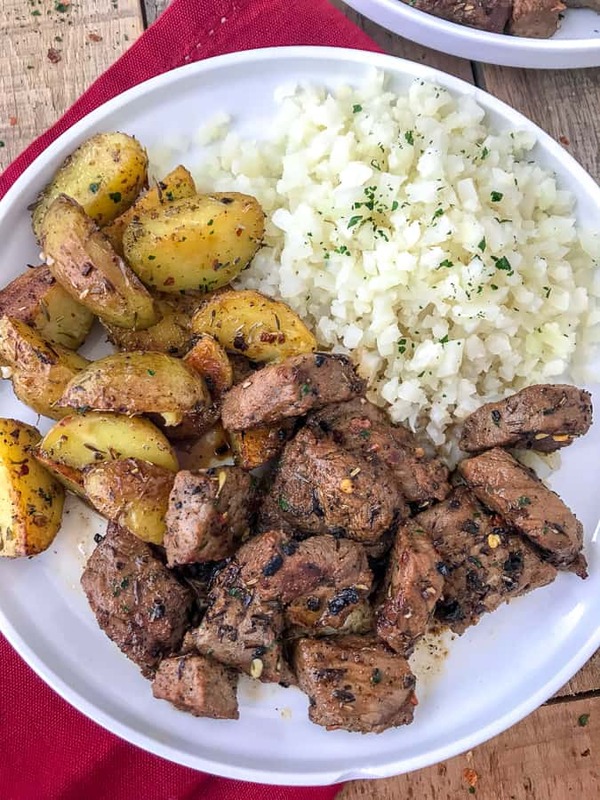 Combine the cubed steak and marinade ingredients, tossing the steak to throughly coat, into an airtight container to sit while you prep the potatoes. Set aside. Slice each baby potato into quarters (or more depending on size) and place them into a large mixing bowl with the olive oil and seasonings. Toss to thoroughly coat. Add butter to a large cast iron skillet over medium heat. Once melted, add in the minced garlic and seasonings, followed by the coated potatoes, cut-side down. Cook 3-5 minutes per side, or until fork-tender, turning when they just start to crisp/brown on one side. Using tongs, remove to a plate and cover with foil to keep warm. Be sure to leave the remaining oil/butter and seasonings for the steak. Increase the temperature to medium-high heat and add the steak to the skillet - with the marinade. Allow the steak to sear for 30-60 seconds before stirring to continue cooking until golden brown. Approximately 1 minute per side or until the they reach desired doneness. Right before the steak is done, add the potatoes back to the skillet to warm. Garnish with herbs, salt, pepper, and crushed red pepper flakes if desired. My tastes buds are going crazy just looking at the pictures of this recipes! This looks amazing! I know my wife would love this too. Thank you! Thanks, Bryan!! Means a lot to me! I hope you and your wife enjoy the recipe when you do make it!